Israeli and Palestinian negotiators have been discussing the creation of a bi-national State in the West Bank and Jordan according to Professor Richard Falk - United Nations Special Rapporteur on the situation of human rights in the Palestinian Territories occupied since 1967. Professor Falk is revered by the Palestinians whilst simultaneously being targeted by many others - including United Nations Secretary General Ban Ki-moon and United Nations High Commissioner for Human Rights Navi Pillay - for his controversial views on a range of matters including his suggestion that the Boston marathon bombing was a justifiable response to America’s interventionist US foreign policy and his posting of an anti-Semitic cartoon on his web site. “I do agree with you about the ‘two state’ solution being a dead letter, and rather bad faith on all sides to pretend otherwise. 1. “I do not discern any support among Palestinians for the Jordan bi-national option that you are proposing"
Jordanian knowledge and acquiescence in those negotiations can be gleaned from the above statement by Jordan’s Minister of Culture - which incidentally was made face to face to his Palestinian counterpart Anwar Abu Aisha in Amman. 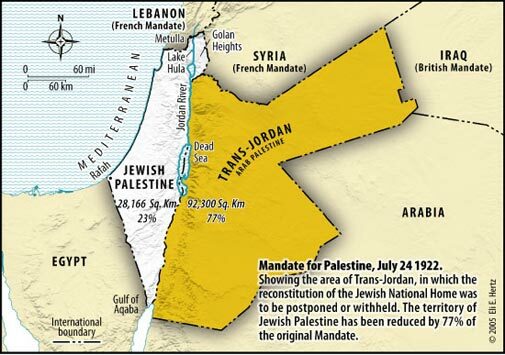 It is a solution which accords with the historic, geographic and demographic realities of the region and will result in the Jews ending up with sovereignty in about 20% of Mandate Palestine and the Arabs with sovereignty in about the remaining 80%. There will be many Jews and Arabs not happy with an outcome that does not yield them 100% and the other nothing. Professor Falk’s opinion that the bi-national state is the best of many bad options will surely resonate with the Palestinians. He has their confidence and their ear. I hope he is instrumental in helping them understand the wisdom of accepting such a resolution - if further conflict and suffering is to be avoided. Maybe indeed we might at last just be seeing some light at the end of the tunnel after travelling for more than 95 years in the darkness - witnessing conflict after conflict with intolerable suffering for both Jews and Arabs. After all - the right to breathe is the most fundamental human right we all have.